Our basic fondant recipe creates a beautiful, smooth, malleable, and super-white fondant for use with cake decorating, candies, and of course, our favorite, gingerbread decorating! Click here to read the differences between fondant, gum paste, and other edible clays. 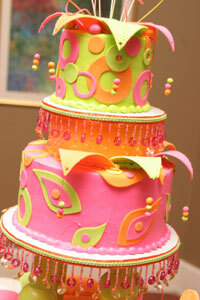 Fondant recipes make a super-white edible clay that is perfect for dying into any color you might want. Color it, roll it out, and cut or shape it into anything you can imagine. You can purchase pre-made fondant online or at cake decorating shops, but this fondant icing recipe is so easy that you can save money and gas by making it yourself... AND keep the bragging rights of having made it all from scratch. This basic recipe contains only ingredients which are easy to find in most grocery stores. Beat butter, vanilla, and salt together until soft. Add condensed milk slowly and beat until mixture is very light. Add the confectioners' sugar cup-by-cup. Dust your work surface with an extra cup of confectioners' sugar. Turn your fondant mixture out onto the work surface and work the powdered sugar in with your hands. Wrap your fondant mixture in plastic wrap as air-tight as possible and then store in a large ziplock bag or sealed container while working with smaller pieces of it. This will help keep it from forming a crust. If you DO get a crust, don't worry, just sprinkle a little confectioners' sugar or, better yet, corn starch and knead it in. What I'll call the "professional" fondant recipe contains several specialty ingredients that aren't always readily available. This DOES make a terrific, easy-to-work-with fondant though! Add warm water to small bowl. Add gelatin and stir until dissolved. Add the glucose and glycerine and stir until dissolved. In a separate, large bowl, sift confectioners' sugar. Make an indention in the center of the sifted sugar and pour in the gelatin mixture. Dust your work surface with confectioners' sugar. Color it, roll it out, and cut or shape it into anything. See the Step 2 link below. add in 3-4 tsps of gum tragacanth if you intend to shape and model the fondant into creatures. What is gum tragacanth? 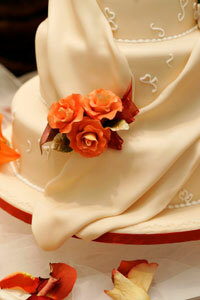 Fondant can also make an edible cloth to drape across something. Whenever you see a cake with icing draped like fabric, they've likely used fondant. Have a Fondant Recipe or Tip to Share? Do you have a favorite Fondant Recipe or even just a tip for using fondant? Share it! Your recipe or tip will appear on a Web page exactly the way you enter it here. You can wrap a word in square brackets to make it appear bold. For example [my recipe] would show as my recipe on the Web page containing your recipe. Return Home from fondant recipe page.